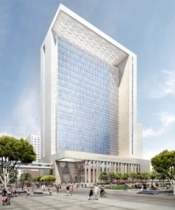 What: A groundbreaking ceremony will commemorate the much-anticipated start of construction of the New Central Courthouse for the Superior Court of California, County of San Diego, in downtown San Diego. Who: The ceremony will include remarks by California Chief Justice Tani G. Cantil-Sakauye, San Diego Presiding Judge David J. Danielsen, and San Diego County District One Supervisor Greg Cox. When: Monday, March 10, 1 p.m.
Why: The event celebrates the beginning of construction of the new San Diego Central Courthouse, the largest new courthouse in the state’s court construction program. The new building will consolidate multiple facilities in the metropolitan area, including the County Courthouse, the Family Courthouse, and the Madge Bradley Courthouse, which are seriously overcrowded, unsafe, and inadequate for modern court operations. The new courthouse will provide a consolidated facility for criminal, civil, probate, family court, and small claims services. The 22-story building will include 71 courtrooms in 704,000 square feet and will feature significant improvements in security, with a secure vehicle sallyport for the transportation of in-custody defendants, as well as better safety, and improved access and efficiency for county residents. Designed by the architectural firm of Skidmore, Owings & Merrill, LLP, the new facility features a three-story lobby atrium and utilizes sunlight to optimize interior lighting. It will connect to the nearby Hall of Justice—which will continue to be used for civil cases—via a pedestrian bridge. The new courthouse is funded by Senate Bill 1407, using trial court user fees, and is being managed by construction contractor Rudolph and Sletten, Inc. Completion is scheduled for fall 2016. For more information, visit the project webpage at www.courts.ca.gov/facilities-sandiego.htm. Members of the media wishing to attend the ceremony should contact Karen Dalton at 619-450-5353, for directions and other background information.